Beyond monetary gifts, there are many ways to support the Craig Foundation. 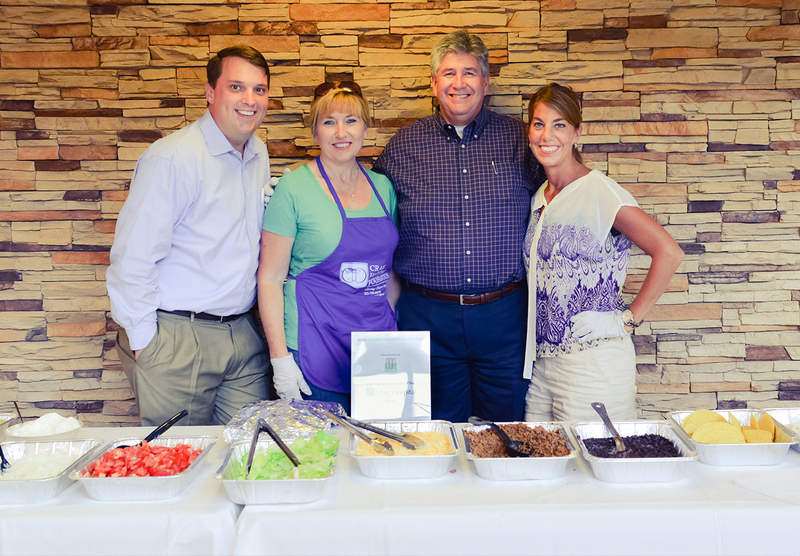 On Family Night, families and patients are invited to a monthly volunteer prepared family-style meal. This gathering serves as a “night out” where patients and their families eat and socialize with one another. Family Night provides a much needed opportunity for Craig patients and their families to relax and interact with other families staying in Craig's Patient and Family Housing Apartments. Family Night is run by volunteers. Corporate teams, service organizations, or a group of close friends are a great fit for this volunteer opportunity. Anyone 18 years of age or older may volunteer for Family Night. The Craig Foundation recommends that your group consists of 4 to 8 individuals. Learn more about how you can get involved with Family Night. To volunteer for Family Night please contact Sara Wells, Event & Communications Specialist, at 303-789-8919 or swells@craighospital.org. You and your community groups are a vital source of support for the patients at Craig Hospital. Host a fundraising event or reach out to people you know to get involved. TeamCraig2018.org is Craig’s hub for online fundraising and an exciting way to increase your impact. At Craig, we understand that power of community to make a difference and encourage you to get your friends, family, colleagues and neighbors involved. In doing so, you’re not only raising valuable dollars that change patients’ lives, but you’re also connecting people to the work of Craig. The options are endless. The key is to find an event or activity that you are passionate about and that you think people in your life will support. We see people raise money through athletic events (hiking, biking, running, rolling), in tribute to a loved one or asking for donations in celebration of milestones, holidays and special occasions. Some grads even choose to raise money in honor of their Craig graduation date! At TeamCraig2018.org, you are able to build your own fundraising website and receive fundraising coaching and tips from the Craig Foundation. To get started with your own peer-to-peer online fundraiser, visit TeamCraig2018.org or contact Becky Plunkett at 303-789-8166 or bplunkett@craighospital.org. Craig has a wide variety of programs specifically designed to support families of patients, including housing for outpatients and families of inpatients, either in our on-site family housing facility or in a nearby hotel. For families of newly injured inpatients who live more than 60 miles from Craig, we offer up to thirty days at no charge. On-site housing units are equipped with kitchenettes, roll-in showers, hide-a-beds, and are spacious for wheelchairs. If no onsite unit is available, we will provide housing in a nearby hotel. After thirty days, housing is available at a discounted rate on-site or at a nearby hotel depending on availability. As you may imagine, in the rush of packing to come to Craig it’s very common for families to forget to pack some basic essentials. That’s where you come in! Care packages assembled and delivered to their rooms will take some stress away while they settle in. Learn more about this service opportunity. "My volunteerism with Craig helps me stay grounded in so many ways. Craig alters the course of patients' futures. I am happy to be a small part of such an important mission." There are number of events that support Craig. Become involved by attending or sponsoring an event. For more information, please visit our events page. Several special events are held each year that serve as fundraisers for Craig. Learn more about our events and how you can participate by joining Craig’s Crew, a team of volunteers that help with special events and fundraising opportunities through the Craig Foundation. If you’d like more information on the Craig’s Crew program, contact Sara Wells at 303-789-8919 or swells@craighospital.org. If you’re a Craig graduate and you’d like to share your story, or a Craig donor who would like to tell us why you give to Craig, fill out our "Share Your Story" form or contact Jordan Ames at 303-789-8108 or james@craighospital.org.